Have you gotten injured in a traffic accident? If so, you may be able to get compensation. No matter what kind of injuries you’ve sustained, our solicitors could help you obtain the compensation you deserve. From incident to incident, accidents on the road can vary quite a bit in terms of causes and situations. For someone who’s never been in a car accident before, it can be difficult to figure out how to go about filing for compensation. 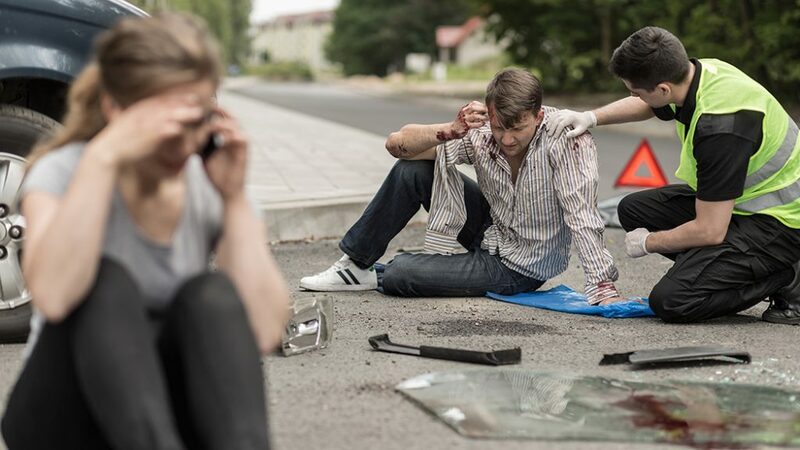 How do you make a compensation claim for a road traffic accident? Do I have to go with the law firm my insurance company recommended? If I can guilty, can I still claim compensation? How much can I receive in terms of compensation? If I sustained my injuries as a passenger and the driver was under the influence, can I make a claim? In what time frame should I file a claim? Do I need to see a doctor before making a claim? What about accidents involving cyclists? How do I file a claim concerning whiplash? Can you still help if my accident was not in the UK? How do I go about making a compensation claim for a car accident? Once we take your claim, we’ll obtain information about your accident and find out who caused your injuries. We’ll figure out your rehabilitation needs make sure you have the appropriate support. Once we know who is at fault for your injuries, we’ll do our best to get them to admit fault. Sometimes this means you could receive payments to cover any immediate expenses you may incur. In most cases the amount of compensation for your injuries will not be disputed by your opponent. If this doesn’t happen, the case will be brought to court. If this happens we will provide support the entire time. Do I have to use the law firm that my insurance company suggested? You are free to choose the law firm that you like. A lot of insurance companies have law firms that they prefer and will recommend but ultimately, it’s up to you. Make sure to choose a lawyer that makes you feel comfortable; one that you can talk to easily. Our company has offices all over the UK. We are not hard to reach by email or phone. You should look at all your choices before you make a decision, so feel free to call us at 0808 164 9153, and we’ll give you a consultation free of charge. You will not be obliged to make a claim. If I was at fault for the accident, can I still file for compensation? If the accident was entirely your fault, then it is not likely that you’ll be able to file for compensation. But if the accident was not entirely your fault, you may be able to make a claim. If you are partially at fault it is likely that you will receive a smaller amount in compensation. If you have any doubts about your ability to make a claim, please call us at 0808 164 9153 for a free advice. We have the experience necessary to determine if you have a claim. How much time should my claim take? The time frame of your claim depends on if your opponent admits responsibility for your injuries and how serious your injuries are. If you have a minor injury, for example, and your opponent admit responsibility, then your claim shouldn’t take longer than a couple months to be settled. But if you’ve suffered injuries of a more serious nature, the process may take longer. This is because evidence provided by a medical professional will need to be gathered in order to agree on an amount of compensation. You should let your injuries heal before finishing a claim, so their severity can be measured fully. If the other person does not admit responsibility and disputes the charges, you may find yourself waiting until the criminal suit is resolved before settling the claim. Click here to learn more about criminal offenses concerning car accidents. If you were a victim of a hit and run and the police are unable to find the other driver your claim may take longer. Click here to find out more about such cases. What amount will I get in compensation? The money you receive depends on your injuries. The more severe your injuries and more losses you’ve had as a result, the more compensation you may be entitled to. Learn more about compensation amounts here. If I was a passenger while the driver was under the influence, can I make a claim? You can make a claim if you were the passenger even if the operator of the vehicle was at fault for the accident. You may receive reduced compensation if you were aware that the drive was intoxicated when you got into the car. Learn more about filing a claim when not the driver in a traffic accident by contacting our office. Can I still make a claim if I didn’t have my seatbelt on? By law, you have to put on a seatbelt, but you may still be able to make a claim even if you weren’t using one when you were hurt. But if you weren’t wearing a seatbelt it’s likely that the level of compensation will be lowered. Contact our team to learn more about making a claim when you weren’t using a seatbelt. How quickly should I make a claim after an accident? You should contact a lawyer as soon as you can even though technically you have thirty-six months to do so. The earlier the better because as soon as you contact a lawyer, an investigation can begin. The investigation will go more smoothly if the accidents are still well remembered by everyone who was present. Mental Capability – if a family member is lacking in mental capacity, a claim can be made for them at any time. Children – you can file a claim for your child until the age of 18. Once your child turns 18, they have until 21 to make a claim themselves. Traffic accidents abroad – in some countries, time limits are shorter than they are in the UK. In some cases, claims can be filed under protection of UK laws. Criminal Injuries – if someone deliberately caused your injuries, a claim can be filed through the Criminal Injury Compensation Authority. A two-year time limit applies in these cases. Unsure whether to file a claim or not? Call us for free advice on 0808 164 9153– we are more than happy to be of assistance. A medical examination is a necessary part of the process. We can arrange this. The examination determines the scope of suffering and ultimately help determine your compensation. You should seek help from a doctor as soon as possible. Your problems could be worse than they first appear. Learn more about medical examinations by getting in touch with our experts. We will work hard to find out who is at fault for the accident and get them to admit liability. If accomplished, then your case can be resolved out of court.This is what happens in the majority of our claims. But if the person responsible does not admit guilt or a compensation amount cannot be agreed upon, court proceeding may be necessary. Don’t worry if this happens, we will be by your side the whole way through. My accident was overseas. Can you still help? Yes, depending on the country we can still help you. We will work hard to help you make a claim. We also have a specialist in life altering injuries. For instance, if you have a brain injury we can help you with a claim as well as any other care you may need. Contact us today with any questions about personal injury claims. We have years of experience in the insurance game. Our team of lawyers will work swiftly on your behalf to settle your claim efficiently and get you the compensation you deserve. There’s a reason why ours is the most trusted name in the business. If you take a minute and fill out the form below we well get back to you shortly.